Neighborhood and suburban trees are a community's asset. 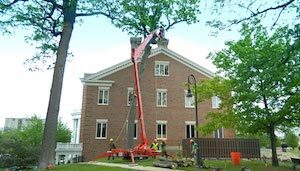 However there are times when they can become problematic and need the services of a professional tree company in Jacksonville, FL. Overgrown trees can threaten property structures; create landscape problems, such as the inability to grow grass; become damaged and hazardous due to strong storms and hurricanes; and, generally not be an asset to a particular landscape. It is situations like this that cause residential clients to our tree service. We provide consulting services as well as our full-spectrum tree care to rid you of problematic trees. Don't allow you trees to be a liability - call us to solve any tree issues you may have on your property. 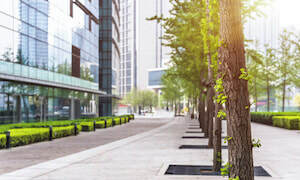 While trees may not be that much of an asset and landscape feature for commercial and industrial properties, business owners can, at times, have similar issues with trees. Furthermore, landscaping can be a bit selling feature for some businesses, especially those with heavy customer traffic. With these business, allow us to care for your trees as they will return the investment with an improved image and perhaps increased sales. We provide all the same tree services to our commercial clients as we do our residential customers. Additionally, we can provide discounts on servicing multiple trees on your business's property. Tree can be assets for residences and businesses alike. However, when they become overgrown or otherwise problematic in their environment, professional tree solutions are needed. Maintaining your trees will help minimize these issues, but due to strong storms or other issues, such as a poor planting location, even properly maintained trees can cause issues. To solve these problems, call the tree service Jacksonville FL residential and commercial clients trust. We even offer emergency tree service when there is a critical, time sensitive problem with your tree(s). We service clients all around the Jacksonville area, to include Saint Augustine, Neptune Beach, Orange Park, Yulee, and Jacksonville Beach. Call us for a free estimate or complete our contact form here.